The most common bird problems in Hull are caused by pigeons. Pigeon waste not only erodes certain surfaces it also looks terrible on cars, buildings and garden furniture. More importantly pigeons carry a wide range of diseases like histoplasmosis, salmonella, cryptococcosis, ornithosis, toxoplasmosis, Newcastle disease and encephalitis. Looking at this list it is easy to understand why professional Pigeon control is so important. Pigeons feel comfortable at heights but also with protection from above. Due to this combination of facts they enjoy places around homes and business premises like soffit areas, I-beams, ledges and attics etc. Once they are established in an area they will also attract more pigeons which will further your problem. Elite pest control will accomplish pigeon removal with bird traps and netting that will eliminate your problem in a humane way. If you wondering how to get rid of a pigeon problem then the first step is to have the area professionally assessed to determine which species of pigeon is causing the problem, what the population size is and what equipment needs to be used. 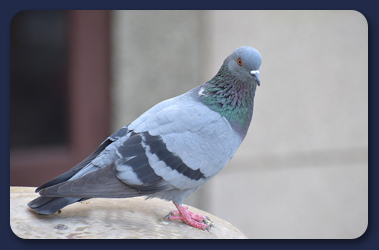 Because there are a variety of methods that can be used for pigeon control, such as netting, trapping, spike systems, etc., it is essential to contact a professional pest control company to determine how to remove the pigeons which are causing your issue.